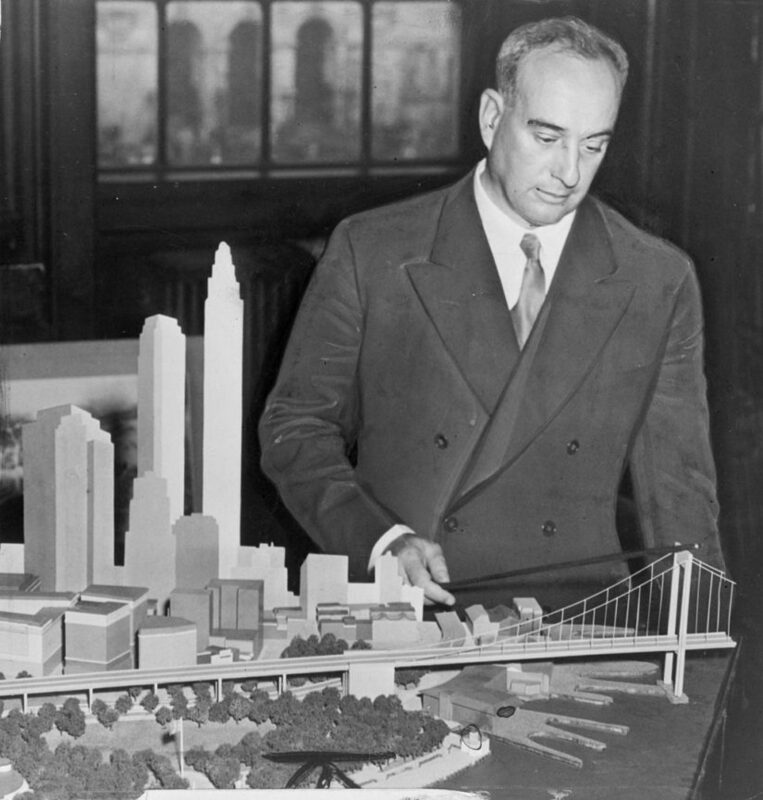 Planner Robert Moses constructed many public parks and promoted new construction of infrastructure, often opposed by preservationists for destroying historic fabric. Moses is a controversial figure in the history of New York. He was directly involved with many public works programs, and yet, he frequently dismissed perpetual public opposition to his work. Robert Moses's personal interests as a city planner and builder frequently led him to clash with civic minded individuals and organizations who were concerned with preserving the traditional fabric of New York's urban landscape. In fact, Moses is one of the primary motivating factors behind the formal organization of preservationists as they felt he threatened the civic beauty and historical significance of New York City. A common theme that permeated among Moses's projects was for large-scale planned development and slum clearance rather than organic urban growth. His main counterpart who successfully challenged his projects was civic activist Jane Jacobs. Her famous book The Death and Life of Great American Cities captured the fervor of the time by revealing the dangers of the post-war economic building boom. The book illustrated the problems associated with large-scale urban renewal projects, which not only threatened the aesthetic environment by demolishing historic buildings but also destroyed community and city vitality. Jacobs encouraged urban diversity by providing mixed-use development while preserving the historic environment. She waged countless battles against many of Moses's proposed projects. In the postwar 1940s, Robert Moses again posed a significant threat, this time in Washington Square. Jane Jacobs spearheaded advocacy campaigns to prevent Moses's grand schemes, which threatened to alter Washington Square Park and Greenwich Village. Moses was also responsible for suggesting the construction of the controversial Central Park Café Pavilion to supermarket heir Huntington Hartford.15 The proposed Pavilion was never approved. Throughout his career, Robert Moses posed a consistent threat to New York City's physical landscape, and it was largely in response to this danger that New Yorkers organized in effort to obtain formal landmark protection legislation. The Robert Moses Papers, The New York Public Library Manuscripts and Archives section, compiled by Charles Kronick, March 1986. Paul Goldberger, “Robert Moses, Master Builder is Dead at 92,” The New York Times, 30 July 1981. Anthony C. Wood, Preserving New York: Winning the Right to Protect A City’s Landmarks (New York: Routledge, 2008), pages 43-4. Anthony C. Wood, Preserving New York: Winning the Right to Protect A City’s Landmarks (New York: Routledge, 2008), page 87. Robert Caro, The Power Broker: Robert Moses and the Fall of New York (New York: Random House: 1974), Chapter 29. George Martin, CCB: The Life and Century of Charles C. Burlingham, New York’s First Citizen, 1858-1959 (New York: Hill and Wang, 2005), page 3. Bard to Honorary Thomas Ball, 19 July 1939, Albert S. Bard Papers, The New York Public Library Manuscripts and Archives section. Anthony C. Wood, Preserving New York: Winning the Right to Protect A City’s Landmarks (New York: Routledge, 2008), page 54. Emily Kies Folpe, It Happened on Washington Square (Baltimore: Johns Hopkins Press, 2002), pages 303-308. ”Willow Town Association Opposes Slum Study of Area,” Brooklyn Heights Press, 2 August 1956. Robert Moses, Public Works: A Dangerous Trade (New York: McGraw Hill, 1970), page 17.